The most polarizing guitar of the Internet era was finally announced after more than a year of teasers. The collaboration between Paul Reed Smith and John Mayer first brought us the much more expensive Super Eagle guitar and then the wonderful J-Mod 100 amplifier. Last year, though, pictures surfaced of John Mayer playing a Strat-like PRS guitar and the Internet went wild. As soon as the guitar was officially announced this year, lovers and haters took to social media to express their wildly different views on a guitar that none of them had ever laid their hand on. In this review, we are (of course) going to evaluate the guitar for what it is and not for its controversy. This is not simply a Strat with a PRS headstock. 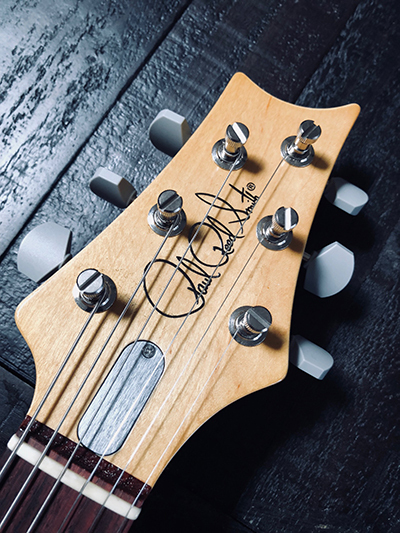 As John Mayer stated in a live Instagram post, he and Paul Reed Smith wanted to create a production model guitar in which every guitar built was “magical” and still bring it to players at an accessible price. 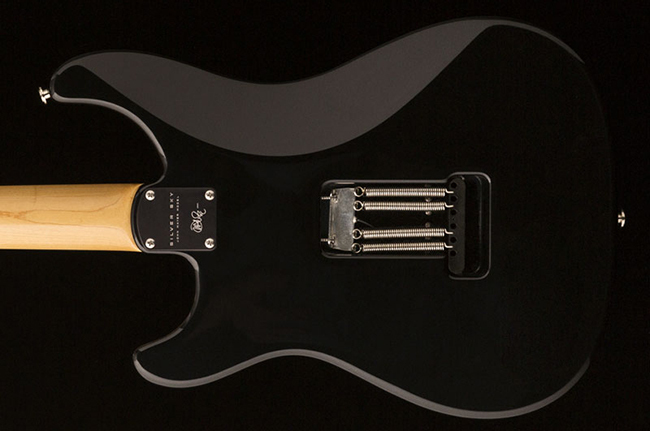 PRS spent two years analyzing and testing different pickups, headstock shapes, and neck shapes. 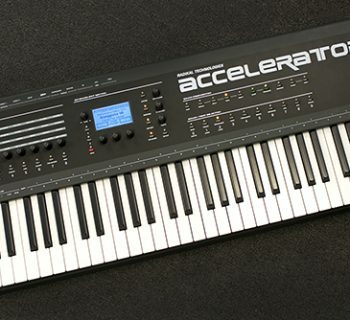 The goal was to create a modern version of a beloved instrument that maintained some of the overall characteristics of the classic but with a number of modern modifications. As Paul Reed Smith pointed out in an interview, every aspect of the guitar was thoughtfully designed, or redesigned. But don’t just take our word for it. Try one out. You may be just as impressed as we are. The PRS Silver Sky is a solid-body, double-cutaway, Strat-style guitar with an alder body and a high gloss poly coat. 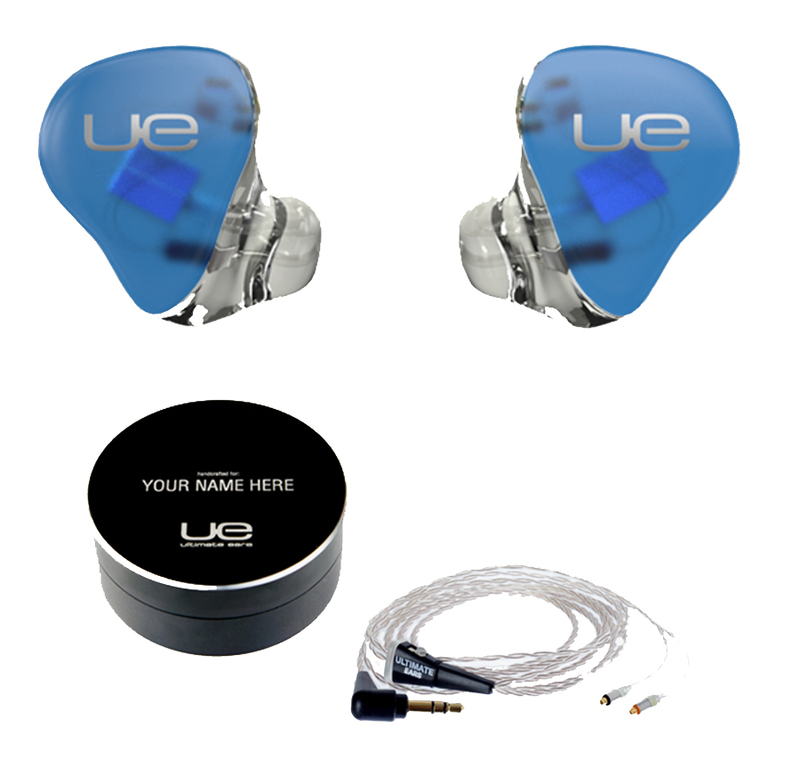 Ours came in the Tungsten (Silver) finish, which looks almost like a premium automobile’s metallic silver finish, but the very fine metal flake gives the guitar brilliance without the look of a sparkle finish. According to PRS, the neck was designed after early ‘60s “vintage” instruments and has a “C-ish” shape. It has a bone nut with a 1.656” width and heavy gloss coating on the 25.5” scale maple neck with a beautiful grain. The width at the twelfth fret is 2.219”. The headstock is a reverse PRS design, but slightly modified to match the contours of the guitar and elongated for better hand access at the first few frets as John points out in the video below. The tilted headstock eliminates the need for a string tree. The tuners are a traditional vintage-style close back design, but with PRS’s locking design. Unlike most PRS locking tuners that have a brass stem, these are made of steel. The tuner head is a matte light grey plastic. The guitar is equipped with three PRS Custom John Mayer 635JM single-coil pickups in typical Strat configuration. Why are they named 635 you ask? Because they sound somewhere between two favorite Strats of John’s: a ‘63 and ’64, hence 63.5 or 635 to not be awkward. The six pickup pole magnet heights on each pickup follow the fretboard radius. The pickup covers have a matte white finish with PRS635JM subtly engraved on them. 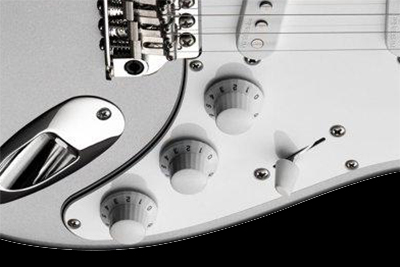 Controls include standard Stratocaster controls with a Master Volume, Tone 1 (neck pickup), Tone 2 (bridge/middle pickup). There is also a standard five-position switch, with hum cancelling in the notch positions 2 and 4. 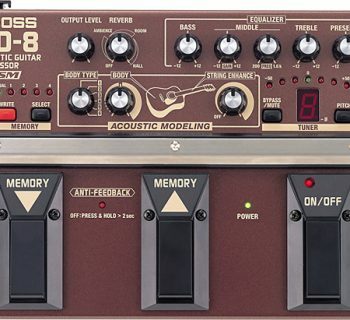 The knobs for the volume and tone controls were specifically designed for this guitar but are not labeled volume or tone as they are in typical configuration and labeling them is unnecessary (according to John). Also, the knobs go from 0-10, unlike typical Strat volume knobs that are 1-10. The pickguard is three-ply white-black-white. The bridge is a vintage style tremolo with six screws and individually adjustable, bent steel saddles and a steel block. There is a threadless, pop-in tremolo arm with an adjustable tension screw. The six bridge screws are PRS Generation 3 set screws which have a knife edge that reportedly helps with tuning stability and bringing the bridge back to position. Per John’s preference, the bridge comes set flush with the body for better sustain and resonance. The jack plate is slightly raised for a unique appearance and easier insertion of a cord. The hardware is shiny chrome except for the saddles, which are a brushed steel, and the top of the locking tuners, which are also in a brushed steel. The body paint is uniform color except for a slight variation in the custom cutaway, lower scoop contour (to accentuate it). Other notable features include having no plate over the back springs/cavity, and PRS strap buttons which are larger than on many guitars and are based off a bass guitar string tree. 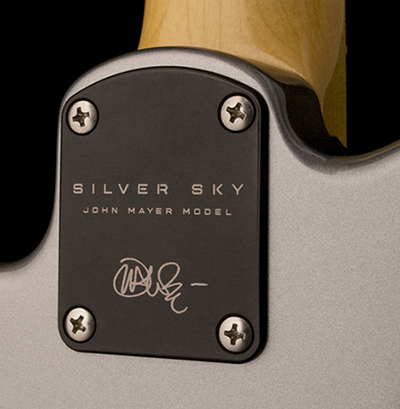 The neck plate is matte black and comes with the name and model of the guitar as well as John Mayer’s signature engraved. Immediately, it was obvious that this was a well-made instrument with everything you would expect from PRS. The fretwork was flawless. The set-up including the intonation and string height was perfect. And weighing in at just under 7.5 pounds, the guitar was comfortable and well balanced. One thing that hasn’t really changed in 60+ years is the position of the arm rest contour on a Strat-style body. 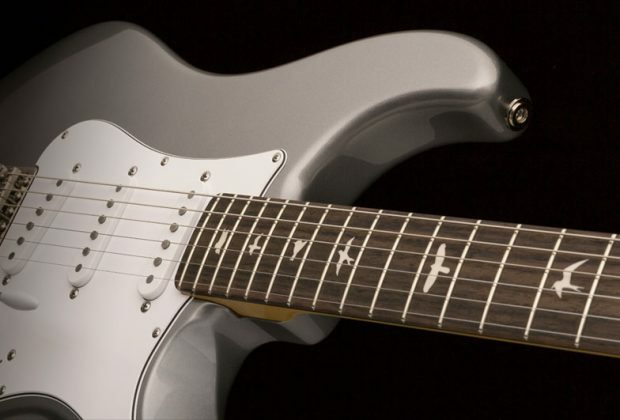 The PRS Silver Sky contour is in a noticeably more comfortable position. If you look down from the top of the body towards the bridge on a Fender Strat, the forearm contour ends right around the back the of the bridge. On the Silver Sky, the forearm contour is a bit softer and extends further towards the headstock. This means more comfort for players that like to either play their guitar tilted with the neck higher or have their axe hang lower than players did back in the ‘50s. One of the most noticeable features of the Silver Sky was just how comfortable the neck was. This neck was specifically designed for this guitar and is thin at the first fret and nice and beefy as you get to the twelfth fret. What was interesting was that the thickness seemed to increase gradually from the nut to the twelfth fret rather than the somewhat sudden increase in thickness that is sometimes felt on guitars. Although we read in one review that it has a “soft-V” shape, this was not at all the case. It was more of a “D” shape at the lower frets and more of “C” shape at the upper frets. The neck was covered in a high gloss finish that was a tad tacky for our tastes, even after a good wipe down. It could probably benefit from a few strokes with some steel wool or an appropriate polish. The contoured neck heel made reaching the upper frets a little bit easier, but not quite as much as we expected. Although, it’s likely not a problem for 6’3” John Mayer, whose hands probably have a longer reach than most players. One of the more controversial features for social media goers was the 7.25” fretboard radius. Let us be clear: it is not an issue on this guitar! As John said in his Instagram Live video, when he picks up a guitar, he doesn’t know what the radius is of a fretboard as long it feels right, and to him, the 7.25” on this guitar felt right. To put naysayers to rest, despite a very comfortable action height we were able to make two whole-step bends without the notes fretting out. So the 7.25” radius was not a hindrance in any way and felt very comfortable and natural on this guitar. We were also able to use a slide on this neck with no problems at all. The tuners were smooth to the touch and the guitar stayed in tune well once our strings broke in. The pots on the volume and tone controls had a nice resistance when turned, but there was a slight rattle when they were touched. The five-way switch was much stiffer than on most Strats, which some players will prefer since it’s much harder to accidently knock it to a different position while playing (and this will of course offend the other half of you who like to flip that switch in an instant when going from rhythm to lead). When the switch is in the neck position, it is a bit closer to the high E string than on typical Strats, and we found ourselves hitting it while playing. With adjustments in our finger and hand positions, though, we quickly got used to the subtle difference. Another thing we noticed—and we have noticed this with other PRS guitars—is that when moving the five-way switch from position to position, it does make a louder sound than traditional five-way switches. In more intimate playing settings, this can be audible. Also, the volume knob is slightly further away from the high E string, which may be more desirable for some players, but may offend pinky swell lovers. Those guys are probably still rocking their vintage Kramers, anyway. The bridge is set up from the factory with the bridge plate flat against the body so the tremolo only can be used for lowering the note and playing a narrow vibrato. Of course, one can change the setup to a floating bridge by loosening the springs and redoing the action and set-up. 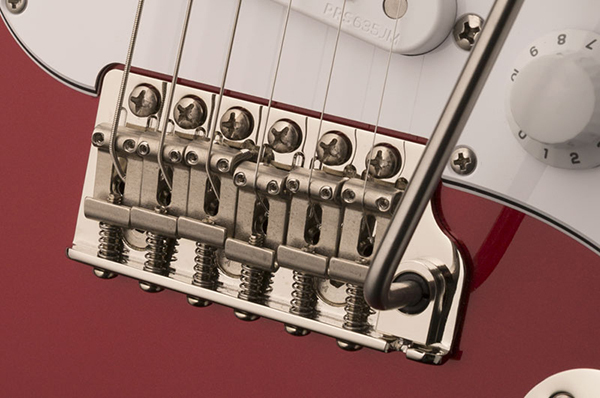 The tension screw for the tremolo arm is located on the top of the bridge, which allows easy access without having to get under the bridge plate. Also, the jack plate is contoured, and it made cable insertion a bit more seamless (and it looked cool, too). Although the PRS strap buttons look cool, we found that the one at the base of the body was not far enough off the body and made it difficult to attach an already broken-in strap. A longer shaft on the button would be helpful. The biggest questions we had: Do the pickups sound like described, with a fuller tone, and is the bridge pickup less harsh than is normally found on typical Strats? John Mayer demonstrates the pickups and the tones on his Instagram live video, and indeed we found the low end to be a bit beefier, the high ends to be less harsh in the bridge position, just as he describes and demonstrates. Now of course, there are many pickup manufacturers with many differently voiced single-coil pickups, but these seemed true to John’s thought that were similar to the sound of his ‘63 and ‘64 Fender Stratocasters. Overall, we would say they sound a touch less glassy and less colored, and bit more round, than one may expect from some single coil pick-ups. They definitely expand the sonic capabilities of a single-coil loaded, Strat-style guitar while still staying true to ‘60s Strat tone. We were curious to hear how the Silver Sky sounded through different amps of ours and how the bridge pickup sounded in particular. We were not disappointed! We started testing on a 5W Tweed-style amp for clean single-coil tones. The sound was sublime, with great clarity to each note. The glassy Strat tones were there, but the tone was appreciably fuller, though not as thick as a humbucker. The bridge pickup with the tone knob all the way to 10 was less harsh than certain classic single-coil pickups, though we don’t have any issue with Fender’s recent model pickups. Drive the amp and roll down the tone knob to around 5-6 on the bridge pickup and we actually did achieve more humbucker-like tones. The neck pickup was nice and thick sounding, with a well-balanced tone, and the middle position, frequently used by Eric Clapton, was well balanced as well. With these fuller-sounding pickups (compared to typical single coil pickups) we made sure that we could still “funk it up” with those critical in-between pickup positions, 2 and 4. Click here to watch additional videos of the Jamiroquai band tearing it up with the Silver Sky. Next it was time to test it on a Supro Dual-Tone, clean channel, and with the amp cranked to 11. At lower volumes, the tones were nice and clean with just enough chime, but more fullness. Drive this amp to 11 and roll down the tone a bit on the bridge pickup and you almost forget you are playing a single-coil guitar. 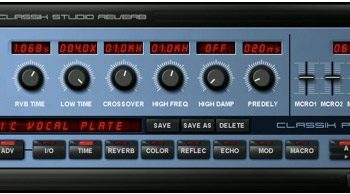 There was a nice punchiness to the tone with a vocal quality to the notes, the tone knob acting a bit like a filter. One question we saw on social media asked how the guitar performed in higher gain settings. Maybe you’ve been thinking of getting a single-coil guitar but were concerned how it would handle heavier rock? In that case, these pick-ups will provide the versatility you need, albeit with some single coil hum in positions 1, 3, and 5. Lock into the middle pickup, roll down the tone, and if you are so blessed with the skills, you can achieve beautiful Eric Johnson-like tones. 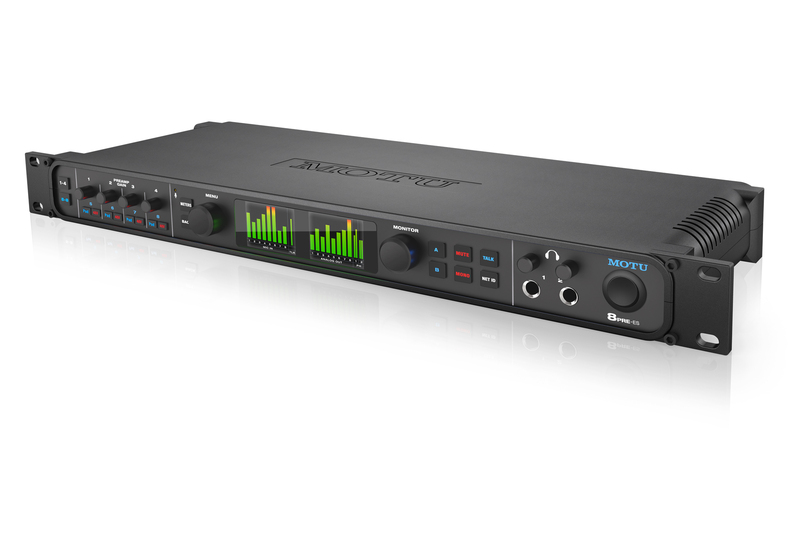 We plugged into a Blackstar HT-20 to address the social media concern and cranked the gain on Channel 2. This amp doesn’t get heavy enough for modern metal, but it was well suited for harder rock and some lighter (err… classic?) metal tones, and the guitar proved very capable. We even played the guitar with an iPad running Bias Amp 2 and Bias Fx, and through a variety of high-gain amp models, here the sky was the limit, no pun intended. The guitar sounded particularly fantastic with a JCM 900-style amp as well as through a Soldano 100-style amp. We almost forgot we were playing single coils! Most resources can be found on the PRS website. The guitar included a basic operating manual that was not Silver Sky specific. It did, however, cover how to string a guitar with PRS locking tuners, as well as provide instructions for basic truss rod adjustments. The PRS Silver Sky sells for $2,299 and comes with a commemorative hard-shell case for the first 500 guitars. After that, it includes a premium gig bag. The guitar comes in four colors: frost (white), horizon (red), onyx (black), and tungsten (silver). This is a good price for a premium, American-made guitar, and the Silver Sky is actually closer in price to an import PRS SE Custom 22 than it is to the Maryland-made Paul Reed Smith Custom 22.